Tremar boat - 4" (101 mm) long. Tremar is a village two miles north of Liskeard in eastern Cornwall. 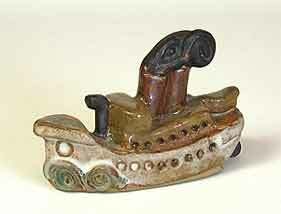 In the early 1960s Roger and Doreen Birkett set up Tremar Pottery there. Roger produced hand-thrown domestic ware that sold well, especially to summer tourists who visited the pottery. The company expanded and by the mid-1970s was operating from three sites. Production had changed to mainly moulded wares, and the Birketts saw that there was a good market for 'collectables'. They produced small animals, people, vehicles, boats and buildings, with invitations on the boxes for the buyer to collect the whole set. Perhaps these were the forerunners of Winter cottages, Colourbox and even Beanie Babies! In the mid-1980s a combination of various economic factors caused the demise of the company.